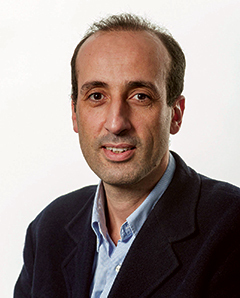 Dr. Omar Elloumi is Chair of the oneM2M Technical Plenary, (Nokia corporate CTO group). He is also the chair of oneM2M Technical Plenary after having led the oneM2M Architecture group delivering the first release of specifications. Omar joined Alcatel-Lucent in 1999 and held several positions including research, strategy and system architecture. He holds a Ph. D. Degree in computer science and served on the ATM Forum and IPSphere Forum Board of Directors. Omar Elloumi is co-editor of books on M2M communications and Internet of Things published in 2012. He is also involved in program committees of several international conferences on M2M and IoT. How our cities will adapt to the fast-developing technological landscape is a major talking point for public and private sector alike. As people start to expect more from their environment, smart city projects are appearing around the globe, with initiatives across the six inhabited continents. However, for this kind of innovation to really take hold and become the norm in our towns and cities of the future, the groundwork must be laid with the platforms of today. A critical factor in ensuring fast and widespread smart city deployments will be the existence of frameworks of technical specifications and standards. oneM2M’s specifications address the need for a common IoT service layer, which sits between IoT applications and the communication hardware and software that transports data. This software-based layer provides functions across different industry segments that IoT applications commonly need. oneM2M’s current specifications – Release 2 - contains a number of significant developments in order to expand the use of Internet of Things (IoT) technology. Semantic interoperability, for example, takes the IoT from simply connecting devices to understanding the data being collected. When it comes to the different technologies and vertical industries within the IoT there are multiple protocols and data models used. Despite them being similar, it presents a need to discover, decode, interwork or translate, the language. Release 2 achieves that by extracting the data from different devices into the common abstract layer, enabling semantic descriptions to be created. As a member organization with a very broad range of specialism, oneM2M deployments take place across a wide range of scenarios, from industrial IoT with powerful machines providing edge intelligence, to consumer technology with constrained devices such as smart watches. However, the one area where we are seeing a very large number of deployments is smart cities. Smart cities highlight the need for a horizontal platform, consisting of a common service layer to allow every component to communicate as one system. This enables city planners to sidestep vertical deployments. This is critical for the scalability of smart cities and to support multiple IoT use cases. An open horizontal platform can leverage existing networks, enable the sharing of software across different applications and allow devices with multiple uses. In South Korea, for example, the Busan Global Smart City cluster project facilitates the interoperability of various IoT services based on the oneM2M platform. oneM2M currently has more than 200 member companies, including major operators, service providers and equipment manufacturers from across the globe. This huge collaborative effort pays dividends when it comes to smart city deployments because of the number of different companies, services and applications to consider – each needing to interoperate between different systems and different platforms. In such a deployment, the oneM2M standard unlocks the ability for various vertical organizations, such as smart utilities, to share data through abstraction and semantic interoperability. As a result, information can be shared between various utility providers in one city to serve the community provided proper authorisations are configured according to privacy principles. In the case of Busan, the Ministry of Science, ICT and Future Planning supports the project and encourages the growth of profitable services and the establishment of an IoT ecosystem in the region with the smart city frameworks validated from oneM2M’s global standards. The project involves developing an Open Smart City platform based on oneM2M standards, creating a clear path way for urban services and establishing governance for the operation. While smart cities would not be doomed to fail without agreed industry standards, deployments would be significantly more expensive to launch and maintain and the systems would be much more complex, potentially reducing innovation among app developers. Additionally, much of the value in cities will come from interworking between different verticals because such interworking will deliver a richer experience for the end-user and increase the richness of the data sets. Here, the role of open standards such as oneM2M is unique in delivering this value and avoiding lock-in to a cloud or software provider. While each city will have its own IoT requirements and priorities, they would benefit from a framework, such as the one provided by oneM2M’s smart city blueprint. This includes key deployment requirements such as a horizontal platform for new deployments, open standards to avoid vendor lock-in, adaptors for existing vertical deployments, and open and semantically-enriched data. 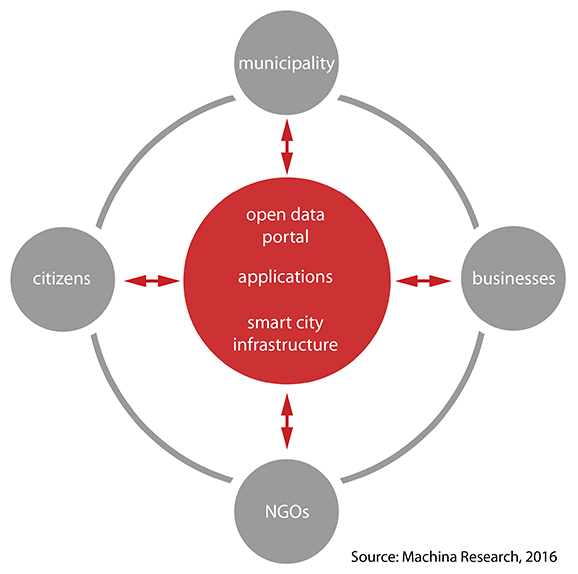 oneM2M believes an open-standards approach is a smarter way of managing smart cities. The oneM2M standard ensures cities will not be locked into proprietary ecosystems that limit technology choice and increase cost over time. An open, interoperable approach allows city managers to mix and match solutions from multiple vendors to meet the specific needs of the city and to have a greater control of its Total Cost of Ownership. To enable city managers control and choice, smart city solutions should be based on globally accepted standards, rather than vendor proprietary developments. As IoT devices continue to be introduced, standardisation is key to achieving universally accepted specifications and protocols for true interoperability between IoT devices and applications. A key differentiator for oneM2M standards is that they take a horizontal approach to ensure they are applicable across different industry verticals. Because of this, oneM2M’s standards can become a base on which other application-specific standards initiatives can build upon. oneM2M re-uses established industry protocols - such as CoAP, MQTT – and protocols, such as Wi-Fi, ZigBee and Bluetooth to create common platforms that can be used across a variety of applications. The best way for smart cities to thrive is to find a common ecosystem in which they can all work together, sharing essential data that can deliver intelligent improvements. This collaborative, horizontal approach can be leant on not only by the trailblazing prototype projects that we see today, but also when smart cities become the norm.